Yesterday we talked about how robots are coming for your menial-labor jobs. But what about artistry? Surely, even with robot poets, robot "dreams", and robot literary aids, there's no way that a computer could become autonomous enough to actually paint something that we'd recognize, right? Wrong, puny human. They can out-art us, too. 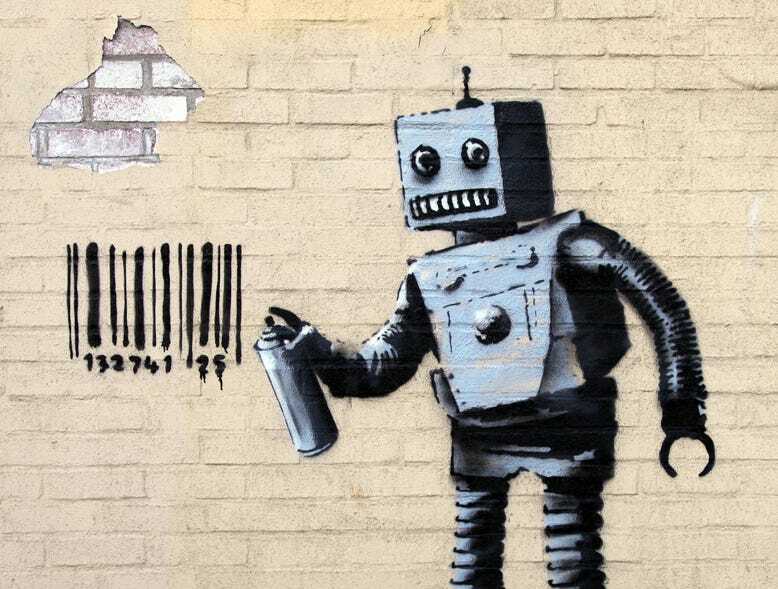 Could a robo-Banksy be tagging the cities of the future? Or will they be more refined, such as a Van Gogh-bot? According to The Pipeteer, the world's first robot art competition has produced some aesthetically amazing results. Created by mechanical engineer Dr. Andrew Conru as a means of recognizing robot artisans worldwide, the contest was open to submissions created either by a computer and software alone, or a 'bot with a bit of human help. As the RobotArt website explains, the competition combined "technology and art...to encourage the advancement of both together. Fundamental to the competition is the belief that creativity and expression are emerging in unexpected ways from our relationship with technology." Fifteen teams from seven countries submitted seventy different piece of art for the inaugural competition. The winners' work appears below, with first prize for "Software Generated" art earning $30,000, and first prize for "Manual (Tele-Robotically) Generated" art earning $10,000. Not a bad payday for an artist of any ilk! from the National Taiwan University. Second place went to "CloudPainter" from George Washington University, USA. And third place went to NoRAA – Accademia di Belle Arti di Brera, Italy. Will the next renaissance be computerized? So there you have it. No avenue of toil or creativity is safe from the robot usurpers. Well, at least autotune doesn't sound like opera...yet. The fourth-place winner, created by "e-David"
Can YOU take a pen and try to do this? That's not really surprising if talented developers made them. I’ve often thought about this World's First Software-Generated Art Competition Produces Striking Results. Nice to have it laid out so clearly. Great eye opener. I have this task to restructure and clean huge amounts of code, including removal of junk code, changing functions/variables names to adhere to naming conventions and similar changes. The return statement is used to return from a function and return control to the calling function. If you issue a return from the main () function, you are essentially returning control to the calling function, which is the operating system. In this case, the return statement and exit () function are similar. Technology has taken everything to the next level hasnt it. very helpfull blog it was a pleasure reading your blog.I suppose you will keep the quality work going on. With so many choices between manufacturers and models, how do you know if the Kindle adbfire download is the best choice. We will go over some of the features that make it stand out in the field of competition.